Every year during this time, teachers flood the stores and web to purchase supplies, organizers and materials for their students and classrooms. Too often they have to use their own money. 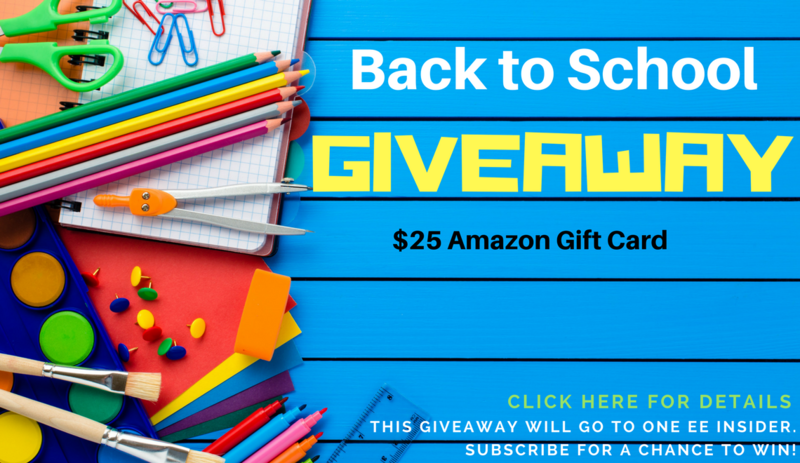 This giveaway will go to one Excellent Educator Insider to get $25 worth of Amazon stuff, simply because you deserve it! READ DETAILS BELOW ON HOW TO ENTER TO WIN! Enter the giveaway with one simple step! Subscribe and become an Excellent Educator Insider to enter for a chance to win! One subscriber from the email list will be chosen and contacted to confirm and redeem your $25 Amazon gift card. It’s as simple as that! Residents of Canada and Quebec are not eligible for this giveaway. The winner will be announced the week of 8/28-9/2. Please read the fine print for giveaway specifics. Congrats! Speech bubbles are hanging mid-air. Congrats to Excellent Educator insider Deleatrice on winning the gift card giveaway! No purchase necessary to enter. Void where prohibited by law. The odds of winning are based on the number of subscribers in the database. Confirmed winner (by random.org) will be contacted by email and the winner will be announced on this post and on social media once confirmed. Winner will have until August 29th to respond or a new winner is chosen. The sponsor (Shakara Hill) will be responsible for the email delivery of the product. There are NO substitutions to the prize. All prizes are final. Please notify me if you have not received your prize within 1 month after you’ve claimed it. This event is in no way administered, sponsored or endorsed but, or associated with Facebook and/or Twitter, Google, Pinterest, Instagram or Klout. This disclosure is done in accordance with the Federal Trade Commission 10 CFR, Part 255 Guides concerning Use of Endorsements. Entrants must only enter by subscribing with one email address, anyone found violating this rule will be disqualified. It is the sole discretion of the admin of the giveaway if the winner has met all the rules or not.